Thank you for joining me once again for a cozy Sunday lesson in British history, particular to your future home (presuming you’re moving to here). Last weekend, we left off just as the Vikings were sacking London. Poor London. It really does get pushed and shoved around during this period. The Danish “Great Heathen Army” begins its conquest of England in 865 and spends the winter of 871 here. It maintains its grip on the city until the forces of King Alfred the Great of Wessex capture it in 886. 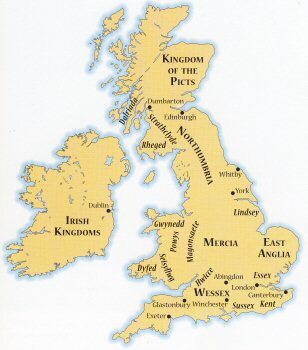 It is at this time reincorporated into the Anglo-Saxon kingdom of Mercia and ruled by Alfred’s son-in-law, Æthelred. The Roman walls (though needing repair) provide a convenient means of defense, so the settlement remains within their original boundaries and is named Lundenburgh thenceforth. The Anglo-Saxon settlement of Lundenwic is referred to as the ealwic or “old settlement” (this term continues into today in the name Aldwych). Also established at this time is a second fortified settlement across the river on the Thames’s Southbank, called Suthringa Geworc (today’s Southwark).